Married to Tomoyo, a former network television broadcaster in Japan...The couple has 2 daughters and a son.Graduated in 1998 from Yokohama High School, where he had an outstanding career...Finished 1998 unbeaten with a then-Japan high school record 208 strikeouts...Led Yokohama to the championship of the 1998 Koshien National High School Tournament with a legendary performance...Defeated traditional powerhouse P.L. Gakuen in the quarterfinals with a 17-inning, 250-pitch complete-game effort...The following day in the semifinals played the outfield but came on in relief to record a save as Yokahama rallied from a 6-run deficit to win...Completed the tournament with a no-hitter in the final vs. Kyoto Seisho High School, the 2nd no-hitter ever pitched in the Koshien championship game...Established a Koshien single-game record with 14 K's.Led Japan to the world amateur championship title in the summer of 1998, earning MVP honors for the tournament.Born on 9/13/80, individuals born in Japan's 1980 fiscal year (April 2, 1980-April 1, 1981) are often referred to as being from the "Matsuzaka generation. Appeared in only 8 games (7 starts) due to seasonending Tommy John Surgery in June.Went 1-1 with a 2.08 ERA (3 ER/13.0 IP) in 2 road starts compared to 2-2 with a 7.03 mark (19 ER/24.1 IP) in 6 home games (5 starts).Held opponents to a .212 AVG (29-for-137) in his 7 starts, the 10thlowest mark among AL starters with at least 50 batters faced...Limited right-handed batters to a .172 clip (10-for-58) overall, 2nd-lowest among ML starters (lowest in AL) who faced at least 50 righties. Went 3-0 with a 3.07 ERA (10 ER/29.1 IP) in last 5 starts from 4/18-5/16, holding opponents to a .146 AVG (15-for-103) during that span...Was 0-2 with a 12.86 mark (10 ER/7.0 IP) and .412 opponent AVG (14-for-34) in his 1st 2 starts, 4/6 and 4/11.Made 100th career Major League start on 4/11 vs. TB...Through his 1st 100 starts, had 546 strikeouts and 46 victories, all with Boston...The only Red Sox pitcher since 1919 with more K's in his 1st 100 games was Roger Clemens (646)...Since 1919, Roger Clemens (56), Boo Ferriss (55), Tex Hughson (50) and Mel Parnell (47) are the only Sox hurlers with more wins through 100 career games.Allowed just a pair of base runners (1 H, 1 BB), tying a career low (also 4/1/08 at OAK, 2 H), while striking out 3 over 7.0 scoreless IP in 1st win of the season, a 9-1 Sox victory on Patriots Day (4/18) vs. TOR...Snapped career-long 7-start winless stretch dating back to 9/7/10.In next start, yielded just 1 hit and 3 walks with 9 K's over 8.0 shutout innings in a 5-0 victory on 4/23 at LAA...Became just the 3rd Boston pitcher since 1919 with back-to-back 1-hit outings of at least 7.0 IP, joining Pedro Martinez (4/19-25/2002) and Howard Ehmke (9/7-11/1923), and the 15th ML hurler in that time to accomplish the feat.Starts on 4/18 and 4/23 marked the 2nd and 3rd time in his career he has held an opponent to 1 hit over 7.0 or more innings (also 5/22/10 at PHI, 1 hit in 8.0 IP)...It is tied for the most such tilts by any pitcher since the start of 2010.15.0-inning scoreless streak over his 2 starts on 4/18 and 4/23 marked 2nd-longest stretch of his career behind a 24.1-inning run from 7/2-22/08...Retired a career-high 19 consecutive batters beginning in the 2nd inning on 4/18 through the 1st on 4/23.Left his start on 4/29 after 4.0 innings (plus 1 batter in the 5th) of 3-run (1 ER) ball due to right elbow tightness...Did not factor in the Sox 5-4 loss.Made his 1st career relief appearance in the 13th inning on 5/4 vs. LAA...Took the loss after allowing 2 runs to score on a bases-loaded single by Bobby Abreu.Placed on the 15-day disabled list on 5/18 (retro to 5/17) and transferred to the 60-day DL on 6/3...Underwent successful surgery on 6/10 to reconstruct a torn ulnar collateral ligament in his right arm...The surgery was performed by Dr. Lewis Yocum in Los Angeles, CA. 2010: Despite 2 trips to the disabled list, finished amongclub leaders in strikeouts (3rd, 133), innings (4th, 153.2)and wins (4th, 9).Held opponents to a .240 average (137-for-571), 3rd among Soxstarters, and held right-handed hitters to a .211 clip (55-for-261), 2ndamong qualifying AL hurlers after Oakland's Trevor Cahill (.198).Limited to 25 starts due to 2 DL stints...Missed the 1st 23 games ofthe season from 4/4-4/30 with a neck strain and also on the DL from6/12 (retro 6/8)-6/23 with a right forearm strain...Missed a scheduledstart on 8/27 with a sore back.Reached 500 career strikeouts with 8 K's in his 91st career ML outingon 8/15 at TEX, becoming the 2nd-fastest Red Sox ever to reach500 K's, trailing only Roger Clemens (79th game, 5/27/87).Won his 46th career ML game with his final victory of the seasonon 9/2 at BAL, passing Shigetoshi Hasegawa (45) for 3rd among Japanese-born hurlers...Eclipsed Hasegawaand Masato Yoshii (both 447) to move into 3rd on the Japanese ML strikeout list on 6/24 at COL...Moved into5th place among Japanese-born pitchers with both his 81st start on 6/7 at CLE (Hideki Irabu, 80) and his 565thinning on 9/14 at SEA (Kazuhisa Ishii, 564.0).Gave up at least 5 runs in 3 of his 1st 4 starts of the season but went 5-2 with a 2.76 ERA (19 ER/62.0 IP) and50 strikeouts over his next 10 outings from 5/22-7/25, the 7th-best ERA in the AL in that time...Allowed 4 ormore runs in 9 of his last 11 starts the rest of the way, going 2-3 with a 5.40 ERA (42 ER/70.0 IP).Collected a career-high 10 no-decisions, the most by any Sox hurler since 2008 (Jon Lester, 11)...Boston won6 of those 10 tilts, including 5 of his last 6, and took 15 of his 25 starts overall.Fired 7.2 hitless innings before allowing a bloop single to Juan Castro with 2 outs in the 8th in a win at PHI on 5/22...Faced 3 batters over the minimum and allowed just the 1 hit in 8.0 shutout frames overall...Was hisdeepest into a game without allowing a hit.Had 8.0 scoreless IP at CLE on 6/7 for 150th career win, including 108 in Japan's Nippon Professional Baseball.Recorded his 1st career regular-season RBI with a single in the 4th on 6/24 at COL...Hit safely in both of hisstarts at an NL ballpark in 2010, also on 5/22 at PHI, becoming the 1st Sox hurler to hit safely in consecutivegames since Josh Beckett on 6/19/07 and 6/24/07.Tallied a season-long 13.2-inning scoreless streak from 6/2-7, his longest since a career-high 24.1-inning runfrom 7/2-22/08.Was unbeaten in 7 straight starts from 7/5-8/10 (3-0, 3.53 ERA), tied for the 3rd-longest such stretch of hiscareer and longest since a 10-start undefeated run from 8/3-9/21/08.Was winless in last 5 starts of the season from 9/7-10/2, tying longest drought of his career (also 9/28/08-5/27/09). Limited to 12 starts and 59.1 innings by a pair of DL stints...Landed on the DL from 4/15-5/22 with a mild right shoulder strain and again with the same injury from 6/21(retro to 6/20)-9/15...Was transferred to the 60-day DL on 7/31...Went 2-6 with an 8.23 ERA (32 ER/35.0 IP) over his 1st 8 starts before beingshut down for the 2nd time on 6/20...Finished strong upon return from DL,going 2-1 with a 2.22 ERA (6 ER/24.1 IP) in 4 starts beginning 9/15...Markedthe 8th best ERA in the AL over that span...Fanned 8.19 batters per 9.0 innings (54 K's/59.1 IP), 10th among AL starterswith at least 50.0 IP...Held opponents hitless in 7 at-bats with the bases loaded in 2009 and hasgone 23 consecutive bases-loaded at-bats without surrendering a hit since allowinga grand slam to BAL's Scott Moore on 9/8/07...Had 4 wild pitches on 5/27, tying the Red Sox single-game record set by MiltGaston on 9/13/1929...Sox hurlers combined for 6 wild pitches in that game,tying the modern, single-game Major League record (since 1900), accomplishedjust 5 other times, also in 2009 by the Angels vs. COL on 6/22/09...Named the MVP of the 2009 World Baseball Classic after going 3-0 with a 2.45 ERA (4 ER/14.2 IP) in 3 startsfor champion Japan...Was also named to the All-Tournament team. Set a career high with 18 wins despite throwing just 167.2 innings...Led the majors inopponents batting average (.211) and placed among American League leaders in wins (T4th), ERA(3rd, 2.90), strikeouts per 9.0 innings (5th, 8.27) and walks (1st, 94). WINNING WAYS : With 18 wins, tied Carl Mays (1916)and Babe Ruth (1915) for the 6th-highest total ever bya Red Sox pitcher in his 2nd major league season...DaveFerriss is the last Sox hurler with more victories in hissophomore campaign with 25 in 1946.Finished 2nd in the A.L. with a .857 winning percentagebehind Cleveland's Cliff Lee (.880, 22-3)...Tied with RogerClemens' 1986 mark (.857, 24-4) as the 4th-highest insingle-season Red Sox history...Only Bob Stanley (.882,15-2 in 1978), Joe Wood (.872, 34-5 in 1912) and RogerMoret (.867, 13-2 in 1973) posted higher marks.Won each of his first 8 decisions in 2008, an 11-startspan from March 25-May 27, during which he loggeda 2.53 ERA (18 ER/64.0 IP)...Was the 11th pitcher in clubhistory to win at least his first 8 decisions in a season,the first since Josh Beckett's 9 straight from April 4-June8, 2007...Was the 2nd-longest winning streak in theA.L. in 2008 to an 11-gamer by Cliff Lee from July 11-September 12...Including a victory in his final start ofthe 2007 season, September 28 vs. Minnesota, had winsin 9 straight decisions, the longest streak by a Red Soxpitcher since Beckett's 9 straight to begin 2007.Did not figure in Boston's 4-3 loss at Seattle on May 27,the club's first defeat in a game started by Matsuzakasince September 14, 2007 vs. the Yankees...Boston went12-0 in his games during that span, the longest teamwinning streak by a Sox pitcher since the club won 12 of David Cone's starts in a row, June3-August 4, 2001. TOUGH TO HIT: Led the majors with a .211 opponents batting average, the first Red Sox pitcher todo so since Pedro Martinez held foes to a .198 clip in 2002...Was the 11th-best in average againstin Red Sox history...Held foes to a .164 clip with runners in scoring position, tops in the majors..Isthe club's best mark since Roger Clemens (.157) in 1994.Held opponents hitless in 14 bases-loaded at-bats in 2008, tied with Texas' Frank Francisco for themost in the majors...Last gave up a hit in that situation on September 8, 2007, a grand slam byBaltimore's Scott Moore...The last Sox hurler to blank foes in at least 14 at-bats over a full seasonwas Derek Lowe (0-for-14) in 2001...Since 1974, Roger Clemens is the only Sox pitcher with morehitless at-bats in that situation in a season, with opponents going 0-for-17 against him in 1994. STRIKING SUCCESS: Was 5th in the A.L. with 8.27 strikeouts per 9.0 innings (154 K's/167.2 IP)...Produced swing and miss strikes on 24.4 percent of his pitches, the 5th-highest ratio in the A.L. WALK HARD: Led the A.L. with 92 walks, the first Red Sox pitcher to do so since Hideo Nomo (96)in 2001...Walked 5 or more batters in 8 starts with wins in 6 of those contests, the most in the majorssince Texas' Bobby Witt had 8 such victories in 1987...His 6 wins in games with at least 5 walkswere the most by a Sox hurler since Mickey McDermott (8) in 1953 (Elias Sports Bureau).Walked a career-high 8 in a 6-3 win at Detroit on May 5, the first Red Sox pitcher to issue at least8 free passes in a victory since Oil Can Boyd walked 8 in a 9-2 win vs. Detroit on June 24, 1985. ROAD WARIOR: Went 9-0 with a 2.37 ERA (20 ER/76.0 IP) in 13 road starts compared to a 9-3mark and 3.34 ERA (34 ER/91.2 IP) at Fenway Park...His road ERA ranked 2nd in the majors amongpitchers with at least 70.0 innings away from home, trailing only San Francisco's Tim Lincecum(2.22)...Was the lowest mark by a Red Soxpitcher with at least that many road inningssince Josh Beckett's 2.18 (22 ER/90.2 IP) markin 2007.His 9 road wins without a loss were themost by a Red Sox pitcher in a season since1954...Tied Jorge Sosa (9-0 in 2005) for the3rd-most by any major league hurler in thatspan...Only Greg Maddux (13-0 in 1995) andJimmy Key (10-0 in 1994) posted more roadwins in a season without a loss in that time. With wins in 9 consecutive road decisions from April 1-September 21, is one of 7 Red Sox roadwinning streaks of at least 9 games since 1956, the first since Pedro Martinez's 13-gamer fromAugust 8, 1999 to August 2, 2000. SHORT WORK: Tossed 167.2 innings on the season, the 2nd-fewest ever by a major league pitcherwith at least 18 wins...Roy Face is first on that list with 18 wins in just 93.1 innings for Pittsburghin 1959...Went 5.0 innings in 5 of his victories, the 2nd-highest single-season total by a Red Soxpitcher since 1956, trailing only Ramon Martinez, who had 6 in 2000. MAKING 'EM EARN IT: Was 3rd in the A.L. with a 2.90 ERA (54 ER/167.2 IP), the lowest by a Soxpitcher since Pedro Martinez's 2.22 ERA (46 ER/186.2 IP) in 2003...Allowed 2 earned runs or less in20 of his 29 starts, tied with the Toronto's Roy Halladay for 4th in the A.L. behind Cleveland's CliffLee (22), Chicago's John Danks (21) and the Yankees Mike Mussina (21).Held opponents scoreless over a span of 24.1 innings from July 2-22, the A.L. 's 4th longest streakthis year behind Oakland's Brad Ziegler (39.0), Cleveland's Cliff Lee (27.0) and Toronto's ScottDowns (26.0). HOMER HAPPY: Surrendered 12 home runs, less than half of his total from 2007 (25)...Tied withCleveland's Cliff Lee and the Mets' Mike Pelfrey for the 5th-lowest total of any major leaguepitcher with at least 150.0 innings...Oakland's Dana Eveland led in that category with just 10round trippers...Combined to give up 3 homers in his first 5 starts through April 18 before permittingjust 2 over his next 12 outings through July 22nd, the fewest in the majors in that spanamong pitchers with at least 50.0 innings. ON THE DL: Landed on the 15-day disabled list for the first time in his major league career on May30 (retroactive to May 28) with a mild right rotator cuff strain...Sustained the injury in Boston's4-3 loss at Seattle on May 27...Allowed 3 runs (2 earned) on 4 hits and fanned 2 without a walk in4.0 innings...Took warm-up tosses before the 5th but left without throwing a pitch in that frame...Gave up 2 runs on 3 hits and a walk with 5 K's in a rehab start for Triple-A Pawtucket on June 16at Philadelphia's Triple-A affiliate Lehigh Valley. OPENING DAY : Started Opening Day against Oakland at the Tokyo Dome in Japan...Is one of6 foreign-born players in major league history to pitch on Opening Day in his native country,including Hideki Okajima who got the win in relief...Was just the 2nd ever to start joining RyanDempster (Gibsons, BC), who took the hill for Florida at Montreal on April 2, 2002...Did not figurein Boston's 10-inning 6-5 win...Allowed 2 runs over 5.0 innings but left trailing 0-2...Retired 10 ofthe final 11 batters he faced including each of the last 7. INSIDE THE NUMBERS: Kept righthanders to a .195 average compared to a .225 mark against lefties...Posted a 1.32 ERA (7 ER/47.2 IP) in 7 starts against A.L. Central opponents, 2nd in the majorsamong pitchers with at least 40.0 innings against those teams...Only Toronto's Jesse Litsch rankedhigher on that list with a 1.21 ERA (7 ER/52.0 IP). MORE 2008 HIGHLIGHTS: Logged a 7-game winning streak over a span of 9 starts from August3-September 21 with a 2.43 ERA (17 ER/63.0 IP), 4th in the A.L. in that time...Won, 3-0, on September21 at Toronto, his final win of the season...Allowed 2 hits with 2 walks and 6 strikeoutsover 7.0 innings, his 5th scoreless start of at least 7.0 frames in 2008...Gave up 2 hits and 2 walkswhile fanning 7 over 8.0 shutout innings in a 8-0 win vs. the White Sox on August 29...Matchedthe longest scoreless outing of his career, done once previously on July 3, 2007 vs. Tampa Bay...Returnedfrom the 15-day DL with a start vs. St. Louis on June 21, allowing 6 runs over a career-low1.0 inning, the shortest start by a Red Sox pitcher since Derek Lowe (1.0) on September 18, 2004 atYankee Stadium...Fanned a season-high 9 batters in his 2nd start of the year, a 2-1 win at Oaklandon April 1...Gave up 1 run on 2 hits without walking a batter over 6.2 innings. SUMMARY: In his 1st major league season, ledthe Red Sox with 32 starts, 204.2 innings, and 201strikeouts while finishing 3rd with 15 wins...Rankedamong American League leaders in strikeouts (6th),strikeouts per 9 innings (6th, 8.84), lowest opponentsbatting average (8th, .246), lowest BA with runnersin scoring position (8th, .229), fewest hits per 9 innings(9th, 8.40), wins (T11th, 15), and innings pitched(14th, 204.2)...Was just the 8th rookie in major leaguehistory to record at least 30 starts, 15 wins, 200.0 innings,and 200 strikeouts in a season. ROOKIE ROYALTY: Led all major league rookies inwins, innings, and strikeouts...Was the 11th Red Soxrookie pitcher to record as many as 15 wins in a season,the 1st since Don Schwall in 1961 (15)...Were themost wins ever in a season by a Japanese-born rookiepitcher, one more than Kazuhisa Ishii's total in 2002with the Dodgers...Hideo Nomo holds the overallsingle-season wins record by a Japanese-born pitcherwith 3 seasons of 16 victories (1996, 2002, 2003).Was 2nd Boston rookie to make at least 32 starts in a season, joining Buck O'Brien (34) in 1912...Was the 14th rookie in club history to throw 200.0+ innings in a season, 1st since Frank Sullivan(206.1 IP) in 1954... O'Brien holds the Sox rookie record with 275.2 IP in 1912. STRIKEOUTS: His 201 strikeouts were a Red Sox rookie record surpassing Ken Brett's mark of 155in 1970...Was the 14th highest total for a rookie since 1900, 5th most in the A.L., and the most fora ML pitcher since Nomo (236) in 1995...Was the 1st Red Sox pitcher with 200 or more strikeoutsin a season since Pedro Martinez (227) and Curt Schilling (203) in 2004...Was 1st ML rookie toreach the 200 inning/200 strikeout plateau since Mark Langston and Dwight Gooden both didit in 1984. Fanned 10 batters in winning his major league debut on April 5 at Kansas City, the most strikeoutsfor a pitcher in his 1st game since Oakland's Aaron Harang fanned 10 on May 25, 2002 againstTampa Bay...Were the most by a Boston pitcher since Don Aase set the club record with 11strikeouts in his ML debut on July 26, 1977 against Milwaukee...Also recorded 10 strikeouts in his3rd start on April 17 at Toronto to become 1st pitcher with 10+ strikeouts twice in his 1st 3 majorleague starts since the Dodgers' Fernando Valenzuela,who had 10 K's in his 2nd and 3rd starts, April 14and 18, 1981, then added 11 in his 4th start on April22...Had his 3rd 10-strikeout game of 2007 on August4 at Seattle, tying club rookie for double digit strikeoutgames with Dave Morehead in 1963; Roger Clemensin 1984; and Aaron Sele in 1993...Overall had 8or more strikeouts 12 times, including 6 straight startsfrom June 5-July 3...Led the majors with 126 strikeouton the road, most by a Red Sox since Pedro Martinez(150) in 2000. YEAR IN REVIEW: After losing 2 of 1st 3 starts, was6-0, 5.17 (27 ER/47.0 IP) in next 7 starts, despite allowing5 or more runs 3 times in that span, and was 7-2, 4.43 through May 25...Dropped his next 3 outings,allowing 10 earned runs in 18.2 innings...Went6-3, 2.49 (20 ER/72.1 IP) in next 11 starts to improveto 13-8, 3.59 through August 10...Over next 7 games,was just 1-4, 8.15 (35 ER/38.2 IP), issuing 5 or moreruns in 5 of those contests...Concluded the regularseason by allowing 2 runs in 8.0 to beat Minnesotaon September 28. MAJOR LEAGUE DEBUT: Was a 4-1 winner in his majorleague debut on April 5 in Kansas City...Allowed 6hits and one run (6th-inning homer to David DeJesus)over 7.0 innings, walking one and striking out 10...Was the 1st Red Sox pitcher to start and win his MLsince Juan Pena beat the Angels on May 8, 1999...Wasthe 12th native of Japan to ever start a major leaguegame, the 3rd for the Red Sox, joining Hideo Nomo(33 in 2001) and Tomo Ohka (25 from 1999-01)...Wasthe 7th native of Japan to make his major league debutin a starting role and the 4th to record a win. THE RUN REPORT: Issued 2 or fewer runs in 17 of 32starts, including 6 straight games from June 5-July3...Lone complete game was a 6-hit, 7-1 victory onMay 14 vs. Detroit, the 1st CG win by a Boston rookiein a regulation game since Tim VanEgmond on July29, 1994 vs. Milwaukee...Worked the 1st 7 innings in a pair of combined shutouts, June 16 vs. SanFrancisco and July 24 at Cleveland, both 1-0 games...Also pitched 8.0 scoreless innings in a 4-1 winversus Tampa Bay on July 3. Also permitted 5 or more runs in a start on 10 occasions...Surrendered 4 or more runs in an inning8 times with 39 of his 100 runs allowed (39%) coming in those 8 innings...Issued just 61 runs inhis other 196.2 innings, good for a 2.79 ERA...Defeated Toronto on September 3 despite allowing7 runs over 5.1 innings, the most runs issued by a Sox pitcher in a win since Tim Wakefield onAugust 8, 2004 at Detroit (7 ER/5.0 IP). SUPPORT STORY: The Red Sox scored 2 runs or less while he was in the game in 12 of his final 22starts beginning May 30, giving him a combined 67 runs of support in those 22 contests, tied for9th fewest in the American League (minimum 100.0 IP) during that stretch...Still, received 130runs of support in his 32 starts, tied for 9th most in the A.L...Ranked 12th in the league with anaverage of 5.72 (130 runs in 204.2 IP) runs per 9 innings...Boston managed just 16 total runs whilehe was in the game in his 12 losses, but scored 91 runs while he was in the game in his 15 wins,an average of 6.1 runs per game. HONOR ROLL: Earned Red Sox Player of the Month honors for June after going 2-2 with a 1.59ERA (6 ER/34.0 IP) and 42 strikeouts in 5 starts, ranking among A.L. leaders for the month in K's(T1st), ERA (2nd), and opponents batting average (2nd, .179)...Named the A.L. Player of the Weekfor May 14-20...Combined to throw 17.0 innings in his 2 starts during the week, including onecomplete game, going 2-0 with a 2.12 ERA (4 ER/17.0 IP)...Placed 4th in BBWAA A.L. Rookie ofthe Year voting with 12 points. 2007 NOTES: Went 7-8 with a 4.02 ERA in 18 road starts and 8-4 with a 4.86 ERA in 14 starts atFenway Park...Was the first Red Sox rookie ever to win 10 games before the All-Star break (10-6, 3.84)... Earned the win on May 25 in Texas despite leaving after 5.0 innings with a stomachillness...Allowed 8 runs over 2.2 innings on September 8 at Baltimore, the shortest outing by aBoston starter in 2007...Led the majors with an average of 108.8 pitches per start with his 130pitches on June 5 at Oakland matching the most by an ML pitcher in 2007...Also placed amongthe A.L. leaders in hit by pitches (4th, 13), walks (6th, 80), most earned runs (T6th, 100), and mosthome runs allowed (T9th, 25). POSTSEASON: Was 2-1, 5.03 (11 ER/19.2 IP) in 4 playoff starts...Had no decision in Game 2 of theALDS versus Los Angeles, issuing 3 runs in 4.2 innings, permitting all 3 runs in the 3rd inning...Alsolasted just 4.2 innings and allowing 4 runs in a 4-2 loss at Cleveland in Game 3 of the ALCS...Surrenderedjust 4 runs in 10.1 frames in winning his last 2 post-season outings...Defeated Cleveland,11-2 in Game 7 of the ALCS (2 R/5.0) at Fenway Park and won at Colorado, 10-5 in Game 3 of theWorld Series (2 R/5.1 IP)...Was the 1st native of Japan to ever win a post-season game and the 1stJapanese native to ever start a World Series game...Is just the 2nd Red Sox rookie to ever earn apost-season win, joining Hugh Bedient (Game 5 of 1912 World Series)...Recorded his 1st major league hit with a 2-run single in the 3rd inning of WS Game 3, the 1st WS hit by a Boston pitchersince Bill Lee in Game 7 of the 1975 fall classic...Was the 1st WS RBI by a Sox pitcher since JoseSantiago homered in Game 1 of the 1967 Series. NPB STANDOUT: Joined the Red Sox after a standout 8-year career with the Pacific League's SeibuLions of Nippon Professional Baseball...Compiled a 108-60 record, 2.95 ERA, and 1,355 strikeoutsover 1,402.2 innings in 204 games/190 starts with the Lions...Led the Pacific League in strikeouts4 times, finished 1st in victories on 3 occasions, and was a 2-time ERA champion...Recorded atleast 14 wins 6 times and fanned 200 or more batters in 4 different seasons...At the plate, had a.211 (4-19) career average with 3 RBI and homer on June 9, 2006 off former major leaguer DarwinCubillan of Hanshin. 4-YEAR RUN: In final 4 seasons at Seibu (2003-06), had a 57-31 record for a .648 winning percentagewith a 2.51 ERA (207 ER/741.1 IP) and 768 strikeouts in 741.1 innings. MORE INTERNATIONAL SUCCESS: Was a member of Japan's national team for both the 2000 and2004 Summer Olympic Games...Had a 1-1 record and 1.69 ERA in 2 starts in 2004 at Athens, defeatingCuba, 6-3 in pool play (2 ER/8.1 IP) and losing to Australia, 1-0 in the semifinals (1 ER/7.2IP)...Became 1st Japanese pitcher to be clocked at 100 miles per hour on radar gun during AthensOlympics...Was 0-1, 2.33 in 3 starts in 2000 at Sydney...Recorded no decisions in pool play versusthe United States (2 ER/10 IP) and Korea (5 ER/9 IP) and lost to Korea, 3-1 in the Bronze MedalGame (3 ER/8 IP CG)...Pitched in 3 games in the 2000 Regional Olympic Qualifying tournamentwith a 1-1 record. VERSUS MLB: Was a member of the NPB All-Star team that faced the Major League Baseball All-Star squad in its 2004 Japan tour...Pitched a 5-hit complete game to defeat the MLB club, 5-1 onNovember 11 at the Sapporo Dome...Did not allow a walk and fanned 6 in 9 innings with the loneMLB extra base hit being a double by Jack Wilson. SUMMARY: Led all NPB teams with 13 complete games, ranked second in the Pacific League with 17wins, a 2.13 earned run average, and 200 strikeouts...placed third in the PL with 186.1 innings, andtied for fifth with two shutouts...established a lifetime best for victories, posted the lowest ERA ofhis pro career and finished third in the Pacific League's Most Valuable Player Award voting. BY THE NUMBERS: Allowed one earned run in eight-inning complete game loss to Fukuoka in season'sfirst start on March 30, then was 7-0, 2.12 (14 ER/59.1 IP) in his next eight starts through May26...went 4-3, 2.14 (15 ER/63 IP in his next nine outings before winning six consecutive starts fromAug. 16-Sept. 19 with a 1.41 ERA (8 ER/51 IP)...allowed season high six earned runs in fiveinnings in season-ending defeat to Chiba on Sept. 26...issued three runs or less 21 times, permittingone or fewer earned runs in 15 starts...allowed just 34 walks in 186.1 innings, an averageof 1.64 every nine innings...permitted just 20 walks in final 128 innings beginning May 26...limitedopponents to a .206 batting average. COMPLETE WHAT YOU START: His 13 complete games were two shy of career high set in 2005...went the route in consecutive starts on three occasions...worked seven or more innings in 19 of 25 startswith high of 10 innings in CG win on July 8 versus Hokkaido...had a pair of CG shutouts, a three-hitteron May 26 versus Hanshin and a five-hitter on Sept. 13 against Hokkaido...worked less than sixinnings just four times, lasting just 0.2 innings on June 24 against Chiba. PLAYOFFS: In final appearance with Seibu, defeated Fukuoka, 1-0 in opening game of PacificLeague playoffs on Oct. 7...issued six hits with no walks, 13 strikeouts, and four hit batters in thecomplete game, nine-inning performance...threw 137 pitches...Lions dropped the next two games ofthe best of three series to the Hawks. MISCELLANEOUS: Fanned 10 or more batters in a game 10 times with season best 14 on three occasions:May 26 and June 9, both vs. Hanshin and Aug. 30 against Orix... recorded 56 strikeoutsin 40 innings over five starts, May 19-June 16...surrendered as many as two homers just three times anddid not allow a long ball in his last six starts, a span of 47 innings, beginning Aug. 23...hit justthree batters, two of those coming in his final start, Sept. 26 versus Chiba...won all four starts versusHokkaido with 1.03 ERA (4 ER/35 IP)...finished second to Fukuoka's Kazumi Saitoh in all three triplecrown pitching categories (wins, ERA, strikeouts)...was 3-for-9 at the plate in interleague play,including first pro homer on June 9 off former Major Leaguer Darwin Cubillan of Hanshin...has a.211 (4-19) career average with three RBIs. WORLD BASEBALL CLASSIC: Was instrumental in Japan's victory in the inaugural World BaseballClassic in March 2006...Was selected as the WBC's Most Valuable Player, winning all 3 of his startswith a 1.38 ERA (13.0 IP, 8 H, 2 R-ER)...Was the only pitcher in the tournament to record 3 winsand pitched the 4th most innings...Earned wins against Chinese Taipei in Round 1 on March 4 atTokyo (4 IP, 3 H, 1 R-ER); Mexico in Round 2 on March 14 at Anaheim (5 IP, 1 H, 0 R); and Cuba inthe Championship Game on March 20 at San Diego (4 IP, 4 H, 1 R-ER)...Held opposition to a .178batting average in the 3 games. JOINING THE RED SOX: On November 2, 2006, the Seibu Lions officially granted permission forMatsuzaka to participate in the "posting" process as outlined in the agreement between MajorLeague Baseball and Nippon Professional Baseball...On November 14, Seibu informed MajorLeague Baseball that they had accepted the highest bid, submitted by the Red Sox, for the negotiatingrights to Matsuzaka...As a result, the Red Sox had a 30-day period in which to negotiate anagreement with the pitcher...The signing was completed and announced on December 14. Topped the Pacific League with 15 complete games and 226 strikeouts, both career highs,and 215 innings...Tied for league lead in shutouts (3), had the 3rd lowest ERA (2.30), and tied for5th in wins (14) despite limited run support...His 15 complete games were 2 less than combinedtotal for PL's 2nd and 3rd place finishers...Recorded 1000th career strikeout in May in 5th fewestinnings in NPB history...Won his 6th Gold Glove for defensive excellence with no errors in 33total chances. Was the Pacific League's ERA champion at 2.90...Of his 10 victories, 5 were complete gameshutouts...Did not make an error in 29 regular season fielding chances...Went 1-1 in 2 starts in theJapan Series against Chunichi...Lost Game 2 but issued just 6 hits and 2 runs in 8 innings to defeatthe Dragons, 4-2 in Game 6 as Seibu went on to win its 1st championship in 14 years. Returned from injury the previous season to lead Pacific League with 215 strikeouts...TiedFukuoka's Kazumi Saitoh for the ERA crown at 2.83, the 1st such tie in NPB history...Ranked 2ndin the league in wins. Was limited to just 14 games and 73.1 innings due to a right elbow injury...Recorded 78strikeouts for 9.57 K's per 9 innings...Marked only pro season where failed to finish 1st in the PLin at least one major pitching category. Finished as the Pacific League leader in wins (15), losses (15), complete games (12), shutouts(2), innings (career high 240.1), walks (117), strikeouts (214), and home runs allowed (27)...Wonthe Sawamura Award as the top pitcher in Japan...Was selected to the Best Nine at season's endfor 3rd consecutive year. Ranked 1st in the Pacific League with 14 wins, 144 strikeouts, and 2 shutouts...Started onopening day at the age of 19 years, 11 months, the NPB's 1st teenage opening day starter in 15years. Was the 1st player selected in the 1998 NPB draft...Went on to be named as the PacificLeague's Rookie of the Year...Topped the PL with 16 wins and placed 3rd with a 2.60 ERA...Became1st rookie to come directly from high school and be selected to Best Nine...Pitched 5 perfectinnings in his regular season debut for Seibu on April 7 and became the 1st rookie a year out ofhigh school to pitch a shutout in April in 44 years...In 1st matchup versus Ichiro Suzuki, fanned theOrix outfielder in 3 straight at bats...Tied NPB rookie record with 15 strikeouts in one game...Receivedthe most all-star votes of any pitcher, the 1st time for a rookie since 1970, and had a rookierecord 5 strikeouts in the all-star game. December 1, 2016 RHP Daisuke Matsuzaka assigned to Gigantes de Carolina. October 30, 2014 RHP Daisuke Matsuzaka elected free agency. August 28, 2014 New York Mets activated RHP Daisuke Matsuzaka from the 15-day disabled list. August 21, 2014 sent RHP Daisuke Matsuzaka on a rehab assignment to Brooklyn Cyclones. August 21, 2014 New York Mets sent RHP Daisuke Matsuzaka on a rehab assignment to Brooklyn Cyclones. August 16, 2014 New York Mets sent RHP Daisuke Matsuzaka on a rehab assignment to Binghamton Mets. August 11, 2014 New York Mets sent RHP Daisuke Matsuzaka on a rehab assignment to St. Lucie Mets. April 16, 2014 New York Mets selected the contract of RHP Daisuke Matsuzaka from Las Vegas 51s. March 31, 2014 RHP Daisuke Matsuzaka assigned to Las Vegas 51s. January 24, 2014 New York Mets signed free agent RHP Daisuke Matsuzaka to a minor league contract and invited him to spring training. August 23, 2013 New York Mets activated RHP Daisuke Matsuzaka. 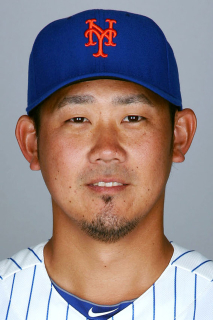 August 22, 2013 New York Mets signed free agent RHP Daisuke Matsuzaka. August 20, 2013 Columbus Clippers released RHP Daisuke Matsuzaka. June 11, 2013 Columbus Clippers activated RHP Daisuke Matsuzaka from the 7-day disabled list. April 30, 2013 Columbus Clippers placed RHP Daisuke Matsuzaka on the 7-day disabled list retroactive to April 29, 2013. April 2, 2013 RHP Daisuke Matsuzaka assigned to Columbus Clippers. March 26, 2013 Cleveland Indians signed free agent RHP Daisuke Matsuzaka to a minor league contract. March 24, 2013 Cleveland Indians released RHP Daisuke Matsuzaka. February 13, 2013 Cleveland Indians signed free agent RHP Daisuke Matsuzaka to a minor league contract and invited him to spring training. November 3, 2012 RHP Daisuke Matsuzaka elected free agency. August 27, 2012 Boston Red Sox activated RHP Daisuke Matsuzaka from the 15-day disabled list. July 30, 2012 sent RHP Daisuke Matsuzaka on a rehab assignment to Pawtucket Red Sox. July 3, 2012 Boston Red Sox placed RHP Daisuke Matsuzaka on the 15-day disabled list. Right upper trapezius strain. June 9, 2012 Boston Red Sox activated RHP Daisuke Matsuzaka from the 60-day disabled list. May 26, 2012 sent RHP Daisuke Matsuzaka on a rehab assignment to Pawtucket Red Sox. May 22, 2012 Boston Red Sox transferred RHP Daisuke Matsuzaka from the 15-day disabled list to the 60-day disabled list. May 7, 2012 Portland Sea Dogs sent RHP Daisuke Matsuzaka on a rehab assignment to Pawtucket Red Sox. April 28, 2012 Daisuke Matsuzaka assigned to Portland Sea Dogs. April 23, 2012 sent RHP Daisuke Matsuzaka on a rehab assignment to Salem Red Sox. April 4, 2012 Boston Red Sox placed RHP Daisuke Matsuzaka on the 15-day disabled list retroactive to March 26, 2012. Recovering from June 2011 Tommy John surgery. October 31, 2011 Boston Red Sox activated RHP Daisuke Matsuzaka from the 60-day disabled list. June 3, 2011 Boston Red Sox transferred RHP Daisuke Matsuzaka from the 15-day disabled list to the 60-day disabled list. May 18, 2011 Boston Red Sox placed RHP Daisuke Matsuzaka on the 15-day disabled list retroactive to May 17, 2011. Right elbow sprain. June 24, 2010 Boston Red Sox activated RHP Daisuke Matsuzaka from the 15-day disabled list. June 12, 2010 Boston Red Sox placed RHP Daisuke Matsuzaka on the 15-day disabled list retroactive to June 8, 2010. Right forearm strain. May 1, 2010 Boston Red Sox activated RHP Daisuke Matsuzaka from the 15-day disabled list. April 6, 2010 sent RHP Daisuke Matsuzaka on a rehab assignment to Pawtucket Red Sox. April 4, 2010 Boston Red Sox placed RHP Daisuke Matsuzaka on the 15-day disabled list. Neck strain. September 15, 2009 Boston Red Sox activated RHP Daisuke Matsuzaka from the 60-day disabled list. September 8, 2009 Pawtucket Red Sox sent RHP Daisuke Matsuzaka on a rehab assignment to Salem Red Sox. September 4, 2009 Daisuke Matsuzaka assigned to Pawtucket Red Sox from Portland Sea Dogs. August 29, 2009 Daisuke Matsuzaka assigned to Portland Sea Dogs from GCL Red Sox. August 24, 2009 Daisuke Matsuzaka assigned to GCL Red Sox. July 31, 2009 Boston Red Sox transferred RHP Daisuke Matsuzaka from the 15-day disabled list to the 60-day disabled list. May 22, 2009 Boston Red Sox activated RHP Daisuke Matsuzaka from the 15-day disabled list. May 5, 2009 Boston Red Sox sent RHP Daisuke Matsuzaka on a rehab assignment to Pawtucket Red Sox.